From chromium to magnesium to herbal remedies claiming to stabilize blood sugar levels, over-the-counter diabetes supplements continue to make their way into the hands of patients who want to manage their disease nature’s way. More than 50% of people with diabetes take nutritional supplements, and those with type 2 diabetes are twice as likely as those with type 1 to experiment with herbal treatments and other nonvitamin, nonmineral pills and capsules, reported Odegard and colleagues in the May/June issue of The Diabetes Educator. More than 80% of diabetes patients are already taking prescription medications to help control their blood sugar. About 58% use one or more oral diabetes drugs, such as sulfonylureas (eg, Glucotrol, Micronase) and meglitinides (eg, Prandin, Starlix) that stimulate insulin release; biguanides (eg, Glucophage, PrandiMet) that decrease glucose production by the liver; alpha-glucosidase inhibitors (eg, Precose, Glyset) that block the breakdown of starches; DPP-4 inhibitors (eg, Januvia, Onglyza) that keep a blood sugar-controlling compound called GLP-1 active longer; and thiazolidinediones (eg, Avandia, ACTOS) that improve insulin action. Another 26% of patients use insulin alone or in combination with oral agents. Given the number of diabetes patients taking prescription medications, Anna Nabutovskaya, CDE, RD, of Maimonides Medical Center in Brooklyn, N.Y., doesn’t recommend over-the-counter supplements for fear of possible contraindications. Constance Brown-Riggs, MSEd, RD, CDE, CDN, a national spokesperson for the American Dietetic Association, says the unknowns about cinnamon mean that people with diabetes should steer clear or be extremely cautious. Ongoing research has reframed the picture for some natural remedies. Chromium is a popular supplement for people with type 2 diabetes thanks to 30 years of studies suggesting it may help control blood sugar. But in Western countries, where chromium deficiency is relatively rare, chromium seems to have little benefit.2 The researchers found that 400 mcg of chromium daily for six months didn’t improve blood sugar control in 400 people with type 2 diabetes, though studies conducted in China and India have found improvements. • Determine why clients are interested in supplements. Are they trying to reduce their medication costs? Avoid drugs altogether? Do they think a “natural” substance is better? Did they just see an infomercial or website touting a sugar-controlling remedy? If a client wants to use a supplement, recommend starting with a single-ingredient type at a moderate dose, Brown-Riggs suggests. Your client will be more likely to know whether any side effects, interactions, or benefits are related to that particular supplement—something that would be difficult to determine if taking several at once. “Take it for a month. If it’s not helping, stop,” she says. Nabutovskaya suggests sticking with products made in the United States. “We know what the manufacturing standards are here; we don’t always know with overseas products,” she warns. • Advise clients to stop taking the supplement immediately if there are adverse effects, and call the doctor to report any problems. While putting these strategies into practice is important, they’re only part of the equation. Our expert panel says it’s just as critical to know about the following supplements diabetes patients commonly take and the research behind them, so you can give them the facts. Recommended dose: 500 mg of cinnamon extract in capsule form taken twice daily3 or 3 to 6 g of powdered cinnamon5 (about 3/4 to 1.2 tsp of ground cinnamon daily) have shown blood sugar-lowering effects in clinical trials. Potential side effects: Coumarin, also found in cinnamon, may worsen liver damage.4 Nabutovskaya warns that higher doses in capsule form could lead to contact dermatitis. How it may work: In a study by Tan and colleagues, published in 2008 in Chemistry & Biology, researchers isolated bitter melon compounds called cucurbitane triterpenoids that activate an enzyme that encourages muscle cells to take up blood sugar. Recommended dose: Bitter melon is used as a vegetable, juice, tea, or taken in capsules. Typical dose is 50 to 100 mL (3 to 6 T) per day. Healthy people who took 500 IUs or more of vitamin D daily were 13% less likely to develop type 2 diabetes than those getting less than 200 IUs per day, according to a September review by Mitri and colleagues published in the European Journal of Clinical Nutrition. But can getting enough vitamin D improve blood sugar control for people who already have type 2 diabetes? In a 2007 review in The Journal of Clinical Endocrinology & Metabolism, Pittas and colleagues reported that vitamin D plus calcium could help support better blood sugar control. “Low vitamin D has been associated with poor glycemic control in some early research, but we don’t know yet if taking it really helps control blood sugar or how it may work,” says Akiyode, who researches the role of vitamin D in the prevention, treatment, and management of diabetes. How it may work: Vitamin D and calcium seem to improve insulin sensitivity, but researchers aren’t sure of the exact mechanism of action. Some experts recommend a blood test to check vitamin D levels before people begin taking supplements; some may need prescription-strength doses for a short time to boost levels. — Sari Harrar is an award-winning freelance writer specializing in health, medicine, and science. Her articles appear in national magazines including O, The Oprah Magazine; Reader’s Digest; Good Housekeeping; Better Homes and Gardens; and Organic Gardening. 1. Davis PA, Yokoyama W. Cinnamon intake lowers fasting blood glucose: Meta-analysis. J Med Food. 2011;14(9):884-889. 2. Kleefstra N, Houweling ST, Bakker SJ, et al. Chromium treatment has no effect in patients with type 2 diabetes in a Western population: A randomized, double-blind, placebo-controlled trial. Diabetes Care. 2007;30(5):1092-1096. 3. Crawford P. Effectiveness of cinnamon for lowering hemoglobin A1C in patients with type 2 diabetes: A randomized, controlled trial. J Am Board Fam Med. 2009;22(5):507-512. 4. Campbell AP. Diabetes and dietary supplements. Clin Diabetes. 2010;28(1):35-39. 5. Hlebowicz J, Hlebowicz A, Lindstedt S, et al. Effects of 1 and 3 g cinnamon on gastric emptying, satiety, and postprandial blood glucose, insulin, glucose-dependent insulinotropic polypeptide, glucagon-like peptide 1, and ghrelin concentrations in healthy subjects. Am J Clin Nutr. 2009;89(3):815-821. 6. Yeh GY, Eisenberg DM, Kaptchuk TJ, Phillips RS. Systematic review of herbs and dietary supplements for glycemic control in diabetes. Diabetes Care. 2003;26(4):1277-1294. 7. National Institutes of Health National Center for Complementary and Alternative Medicine. Dietary supplements and type 2 diabetes. 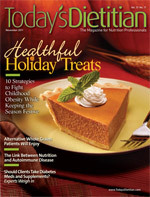 Available at: http://nccam.nih.gov/health/diabetes/CAM-and-diabetes.htm#supplements. Last accessed September 2011. 8. National Institutes of Health Office of Dietary Supplements. Dietary supplement fact sheet: Vitamin D. Available at: http://ods.od.nih.gov/factsheets/vitamind. Last accessed September 2011. 9. Centers for Disease Control and Prevention National Centers for Health Statistics. Vitamin D status: United States, 2001–2006. NCHS Data Brief. Number 59. Available at: http://www.cdc.gov/nchs/data/databriefs/db59.htm. Last accessed September 2011. 10. Institute of Medicine of the National Academies. Dietary Reference Intakes for calcium and vitamin D. November 2010. Available at: http://www.iom.edu/Reports/2010/Dietary-Reference-Intakes-for-Calcium-and-Vitamin-D/DRI-Values.aspx. Last accessed September 2011. 11. National Institutes of Health Office of Dietary Supplements. Dietary supplement fact sheet: Magnesium. Available at: http://ods.od.nih.gov/factsheets/magnesium. Last accessed September 2011. 12. de Lourdes Lima M, Cruz T, Pousada JC, Rodrigues LE, Barbosa K, Canguçu V. The effect of magnesium supplementation in increasing doses on the control of type 2 diabetes. Diabetes Care. 1998;21(5):682-686. 13. Linus Pauling Institute Micronutritient Information Center. Magnesium: Linus Pauling Institute recommendation. Available at: http://lpi.oregonstate.edu/infocenter/minerals/magnesium/index.html#lpi_recommend. Last accessed September 2011.